Proposition 23: Suspends Air Pollution Control Laws Requiring Major Polluters to Report and Reduce Greenhouse Gas Emissions That Cause Global Warming Until Unemployment Drops Below Specified Level for Full Year. Initiative Statute. A NO vote on this measure means: The state could continue to implement the measures authorized under Assembly Bill 32 to address global warming. Global Warming and Greenhouse Gases. Greenhouse gases (GHGs) are gases that trap heat from the sun within the earth’s atmosphere, thereby warming the earth’s temperature. Both natural phenomena (mainly the evaporation of water) and human activities (principally burning fossil fuels) produce GHGs. Scientific experts have voiced concerns that higher concentrations of GHGs resulting from human activities are increasing global temperatures, and that such global temperature rises could eventually cause significant problems. Such global temperature increases are commonly referred to as global warming, or climate change. As a populous state with a large industrial economy, California is the second largest emitter of GHGs in the United States and one of the largest emitters of GHGs in the world. Climate change is a global issue necessitating an international approach. Actions in California regarding GHGs have been advocated on the basis that they will contribute to a solution and may act as a catalyst to the undertaking of GHG mitigation policies elsewhere in our nation and in other countries. Assembly Bill 32 Enacted to Limit GHGs. In 2006, the state enacted the California Global Warming Solutions Act of 2006, commonly referred to as Assembly Bill 32 or “AB 32.” This legislation established the target of reducing the state’s emissions of GHGs by 2020 to the level that emissions were at in 1990. It is estimated that achieving this target would result in about a 30 percent reduction in GHGs in 2020 from where their level would otherwise be in the absence of AB 32. Assembly Bill 32 requires the state Air Resources Board (ARB) to adopt rules and regulations to achieve this reduction. The law also directs ARB, in developing these rules and regulations, to take advantage of opportunities to improve air quality, thereby creating public health benefits from the state’s GHG emission reduction activities. Other Laws Would Reduce GHG Emissions. In addition to AB 32, a number of other state laws have been enacted by the Legislature that would reduce GHG emissions. In some cases, the main purpose of these other laws is specifically to reduce GHG emissions. For example, a 2002 law requires the ARB to adopt regulations to reduce GHG emissions from cars and smaller trucks. Other laws have authorized various energy efficiency programs that could have the effect of reducing GHG emissions, although this may not have been their principal purpose. “Scoping Plan” to Reach GHG Emission Reduction Target. As required by AB 32, the ARB in December 2008 released its plan on how AB 32’s GHG emission reduction target for 2020 would be met. The plan—referred to as the AB 32 Scoping Plan—encompasses a number of different types of measures to reduce GHG emissions. Some are measures authorized by AB 32, while others are authorized by separately enacted laws. Some of these measures have as their primary objective something other than reducing GHGs, such as reducing the state’s dependency on fossil fuels. The plan includes a mix of traditional regulatory measures and market-based measures. Traditional regulations, such as energy efficiency standards for buildings, would require individuals and businesses to take specific actions to reduce emissions. Market-based measures provide those subject to them greater flexibility in how to achieve GHG emission reductions. The major market-based measure included in the Scoping Plan is a “cap-and-trade” program. Under such a program, the ARB would set a limit, or cap, on GHG emissions; issue a limited number of emission allowances to emitters related to the amount of GHGs they emit; and allow emitters covered by the program to buy, sell, or trade those emission allowances. Some measures in the Scoping Plan have already been adopted in the form of regulations. Other regulations are either currently under development or will be developed in the near future. Assembly Bill 32 requires that all regulations for GHG emission reduction measures be adopted by January 1, 2011 and in effect by January 1, 2012. Fee Assessed to Cover State’s Administrative Costs. As allowed under AB 32, the ARB has adopted a regulation to recover the state’s costs of administering the GHG emission reduction programs. Beginning in fall 2010, entities that emit a high amount of GHGs, such as power plants and refineries, must pay annual fees that will be used to offset these administrative costs. Fee revenues will also be used to repay various state special funds that have made loans totaling $83 million to the AB 32 program. These loans have staggered repayment dates that run through 2014. The Economic Impact of Implementing the Scoping Plan. The implementation of the AB 32 Scoping Plan will reduce levels of GHG emissions and related air pollutants by imposing various new requirements and costs on certain businesses and individuals. The reduced emissions and the new costs will both affect the California economy. There is currently a significant ongoing debate about the impacts to the California economy from implementing the Scoping Plan. Economists, environmentalists, and policy makers have voiced differing views about how the Scoping Plan will affect the gross state product, personal income, prices, and jobs. The considerable uncertainty about the Scoping Plan’s “bottom-line” or net impact on the economy is due to a number of reasons. First, because a number of the Scoping Plan measures have yet to be fully developed, the economic impacts will depend heavily on how the measures are designed in the public regulatory process. Second, because a number of the Scoping Plan measures are phased in over time, the full economic impacts of some measures would not be felt for several years. Third, the implementation of the Scoping Plan has the potential to create both positive and negative impacts on the economy. This includes the fact that there will be both “winners” and “losers” under the implementation of the Scoping Plan for particular economic sectors, businesses, and individuals. A number of studies have considered the economic impacts of the Scoping Plan implementation in 2020—the year when AB 32’s GHG emission reduction target is to be met. Those studies that have looked at the economic impacts from a relatively broad perspective have, for the most part, found that there will be some modest reduction in California’s gross state product, a comprehensive measure of economic activity for the state. These findings reflect how such things as more expensive energy, new investment requirements, and costs of regulatory compliance combine to increase the costs of producing materials, goods, and services that consumers and businesses buy. Given all of the uncertainties involved, however, the net economic impact of the Scoping Plan remains a matter of debate. AB 32 Would Be Suspended, Likely for Many Years. Under this proposition, AB 32 would be suspended immediately. It would remain suspended until the state’s unemployment rate was 5.5 percent or less for four consecutive quarters (a one-year period). We cannot estimate when the suspension of AB 32 might end. 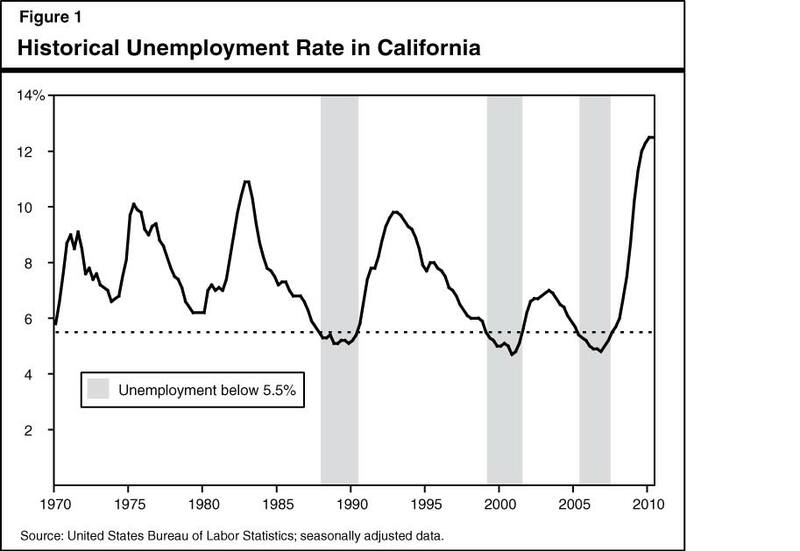 Figure 1 provides historical perspective on the state’s unemployment rate. It shows that, since 1970, the state has had three periods (each about ten quarters long) when the unemployment rate was at or below 5.5 percent for four consecutive quarters or more. The unemployment rate in California for the first two quarters of 2010 was above 12 percent. Economic forecasts for the next five years have the state’s unemployment rate remaining above 8 percent. Given these factors, it appears likely that AB 32 would remain suspended for many years. The proposed cap-and-trade regulation discussed above. The “low carbon fuel standard” regulation that requires providers of transportation fuel in California (such as refiners and importers) to change the mix of fuels to lower GHG emissions. The fee to recover state agency costs of administering AB 32. New vehicle emission standards for cars and smaller trucks. A program to encourage homeowners to install solar panels on their roofs. Land-use policies to promote less reliance on vehicle use. Building and appliance energy efficiency requirements. We estimate that more than one-half of the emission reductions from implementing the Scoping Plan would come because of laws enacted separately from AB 32. There would likely be both positive and negative impacts on the California economy if AB 32 were suspended. These economic impacts, in turn, would affect state and local government revenues. We discuss these effects below. Potential Positive Economic Impacts. The suspension of AB 32 would likely have several positive impacts on the California economy. Suspending AB 32 would reduce the need for new investments and other actions to comply with new regulations that would be an added cost to businesses. Energy prices—which also affect the state’s economy—would be lower in 2020 than otherwise. This is because the proposed cap-and-trade regulation, as well as the requirement that electric utilities obtain a greater portion of their electricity supplies from renewable energy sources, would otherwise require utilities to make investments that would increase the costs of producing or delivering electricity. Such investments would be needed to comply with these regulations, such as by obtaining electricity from higher-priced sources than would otherwise be the case. The suspension of such measures by this proposition could therefore lower costs to businesses and avoid energy price increases that otherwise would largely be passed on to energy consumers. Potential Negative Economic Impacts. The suspension of AB 32 could also have negative impacts on the California economy. For example, the suspension of some Scoping Plan measures could delay investments in clean technologies that might result in some cost savings to businesses and consumers. Investment in research and development and job creation in the energy efficiency and clean energy sectors that support or profit from the goals of AB 32 might also be discouraged by this proposition, resulting in less economic activity in certain sectors than would otherwise be the case. Suspending some Scoping Plan measures could halt air quality improvements that would have public health benefits, such as reduced respiratory illnesses. These public health benefits translate into economic benefits, such as increased worker productivity and reduced government and business costs for health care. Net Economic Impact. As discussed previously, only a portion of the Scoping Plan measures would be suspended by the proposition. Those measures would have probably resulted in increased compliance costs to businesses and/or increased energy prices. On the other hand, those measures probably would have yielded public health-related economic benefits and increased profit opportunities for certain economic sectors. Considering both the potential positive and negative economic impacts of the proposition, we conclude that, on balance, economic activity in the state would likely be modestly higher if this proposition were enacted than otherwise. Economic Changes Would Affect State and Local Revenues. Revenues from taxes on personal and business income and on sales rise and fall because of changes in the level of economic activity in the state. To the extent that the suspension of AB 32 resulted in somewhat higher economic activity in the state, this would translate into an unknown but potentially significant increase in revenues to the state and local governments. Impacts of Suspension of the Cap-and-Trade Regulation. The suspension of ARB’s proposed cap-and-trade regulation could have other fiscal effects depending on how this regulation would otherwise have been designed and implemented. One proposed approach provides for the auctioning of emission allowances by the state to emitters of GHGs. This approach would increase costs to affected firms doing business in the state, as they would have to pay for allowances. Such auctions could result in as much as several billion dollars of new revenues annually to the state that could be used for a variety of purposes. For example, depending on future actions of the Legislature, the auction revenues could be used to reduce other state taxes or to increase state spending for purposes that may or may not be related to efforts to prevent global warming. Thus, the suspension of AB 32 could preclude the collection by the state of potentially billions of dollars in new allowance-related payments from businesses. Potential Impacts on State and Local Government Energy Costs. As noted above, the suspension of certain AB 32 regulations would likely result in lower energy prices in California than would otherwise occur. Because state and local government agencies are large consumers of energy, the suspension of some AB 32-related regulations would reduce somewhat state and local government energy costs. Impacts on State Administrative Costs and Fees. During the suspension of AB 32, state administrative costs to develop and enforce regulations pursuant to AB 32 would be reduced significantly, potentially by the low tens of millions of dollars annually. However, during a suspension, the state would not be able to collect the fee authorized under AB 32 to pay these administrative costs. As a result, there would no longer be a dedicated funding source to repay loans that have been made from certain state special funds to support the operation of the AB 32 program. This would mean that other sources of state funds, potentially including the General Fund, might have to be used instead to repay the loans. These potential one-time state costs could amount to tens of millions of dollars. Once AB 32 went back into effect, revenues from the AB 32 administrative fee could be used to pay back the General Fund or other state funding sources that were used to repay the loans. In addition, once any suspension of AB 32 regulations ended, the state might incur some additional costs to reevaluate and update work to implement these measures that was under way prior to the suspension.